Ditch the oil without losing the beloved flavor and texture of fried chicken with this healthy-ish recipe. Instead of deep-frying, the chicken is dredged in seasoned flour and crispy panko breadcrumbs, then baked until the coating is crunchy and the meat is tender. You'll never even miss the high calorie alternative! Using chicken drumsticks allows for maximum breading, and dark meat tends to have more flavor than white meat. However, you could also use this treatment on chicken thighs and breasts as well with good results. Serve with mashed potatoes, biscuits and collard greens for a Southern-inspired feast! Let the chicken marinate in the refrigerator for a few hours if you want the mustard and spices to feature more prominently in the flavors of this dish. For super tender chicken, marinate it in buttermilk seasoned with a little salt for up to 24 hours before baking. Per Serving: 441 calories; 19g fat; 16.2g carbohydrates; 48g protein; 235mg cholesterol; 532mg sodium. crispy, crunchy, and so perfectly juicy inside! will make again. This no-fry fried chicken is so good! I absolutely love it! 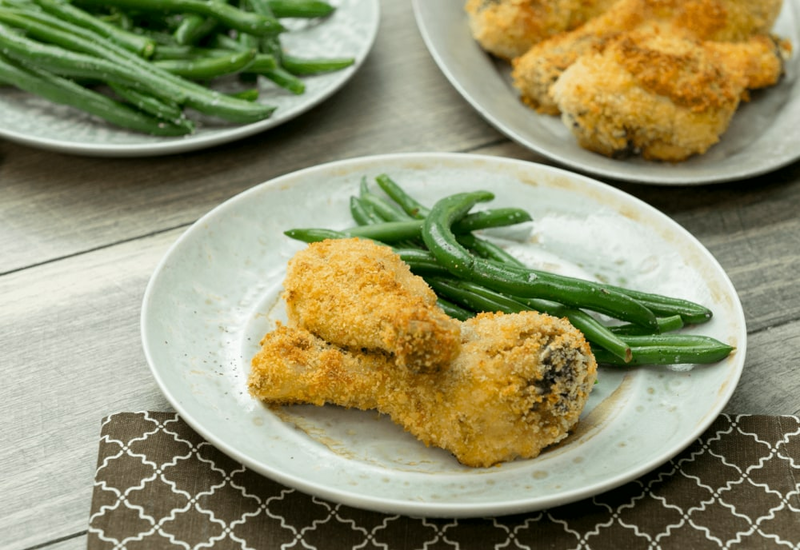 The spicy brown mustard and panko bread crumbs give this chicken great taste and crunch. Guilt free fried chicken! Yes! This is finger licking good. My boys couldn't get enough! Definitely on our weekly rotation. This fried chicken is like the real thing, but without the oil. The garlic, onion, and thyme seasoning gives the chicken good flavor. It's also really easy to make. I let it marinate for a few hours and then put them in the oven. Also a big hit with the kids. We used a seasoned salt and Creole-style mustard for this recipe. Much healthier than frying food in oil. The panko bread crumbs were perfect. Easy and kid friendly!